Do you know someone who inspires? 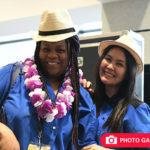 Calling all DEI advocates! 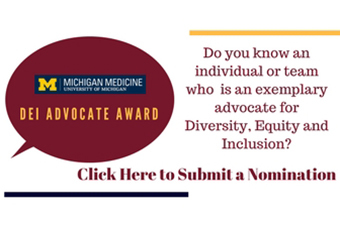 The Office for Health Equity and Inclusion is seeking nominations for the Michigan Medicine DEI Advocate Award, an award designed around recognizing faculty, staff, learners (i.e. students, house officers and/or post-doctoral trainees) and teams who inspire culture change across the academic medical center. 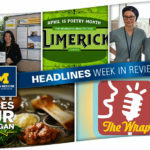 Nominees should exemplify what it means to be a true DEI advocate: someone who goes above and beyond to make Michigan Medicine a more diverse, equitable and inclusive community. Developing and/or promoting inclusive scholarship and teaching. Contributed to workplace and/or teaching improvements that ultimately support the academic medical center’s commitment to DEI. 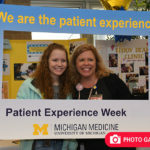 All regular faculty, staff and learners of Michigan Medicine are eligible to be nominated for the DEI Advocate Award. Evaluation of award nominee submissions will be guided by originality, impact, practicality, measurability and applicability. The deadline for nominations is April 13. To learn more about the award criteria and to submit a nomination, please click here.